There are some 9000 species of neognaths, by far the majority of living birds, assigned to over 140 families. Most of these families have a fossil record (Unwin, 1993) and in many cases this runs back to the Eocene, except for the song-birds, the passeriforms, which arose in the Eocene and radiated dramatically in the Miocene and Pliocene. Because of the diversity of the modern bird groups and the incomplete nature of many fossils, no attempt will be made here to catalogue them all (see Unwin (1993) and Feduccia (1999a) for fuller details). The key groups are noted and some unusual fossil taxa are highlighted. Neognaths are characterized by features of the palate (see Box 9.2), as well as by a peculiar character of the ankle: the ascending process of the ankle bones that runs up in front of the tibia seems to have switched allegiance from the astragalus to the calcaneum. the lower end of the tibia (Figure 9.11(a)). This process in ratites (Figure 9.11(b)) has been interpreted as a new element called the pretibial bone. Hence, it could be argued that birds arose from some other source among the archosaurs and that the ratites are degenerate neognaths. Embryological evidence (McGowan, 1985), however, shows that the process in ratites is homologous with that of the theropod dinosaurs. 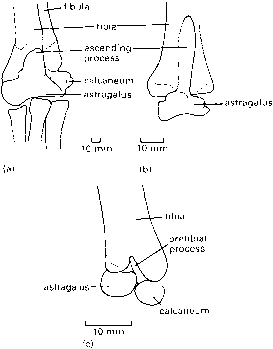 The neognath ascending process (Figure 9.11(c)) starts development as a small cartilaginous nubbin associated with the astragalus, but shifts to an attachment on the calcaneum before it ossifies. It is unclear when this shift occurred, but the calcaneal ascending process is a synapomorphy of all neognaths. Compared with other groups of vertebrates, it has so far proved almost impossible to resolve the phylogeny of neognaths. The tentative tree (see Box 9.4) includes much uncertainty, but one result that has been agreed by all is that the Anseriformes (ducks) and Galliformes (fowl and game birds) form a clade, the Galloanserae, and this is the sister group of all other neognaths, termed Neoaves. Modern groups of ducks and swans (Livezey, 1997) date back to the Eocene when some goose-like fossils appeared, and game birds (Dyke et al., 2003) have also been first found in the Eocene. Even older are the pres-byornithids, for long a mystery, but now firmly allied with ducks (Ericson, 1997; Livezey, 1997). The first presbyornithids are reported from the latest Cretaceous (Kurochkin et al., 2002) and the group was particularly diverse in the Eocene.Presbyornis (Figure 9.12(a)) has a duck-like head and neck, but its legs are much longer than in typical anseriforms. Unusual extinct relatives of the ducks and game birds include the giant flightless gastornithiforms from the Palaeocene and Eocene of North America and Europe. 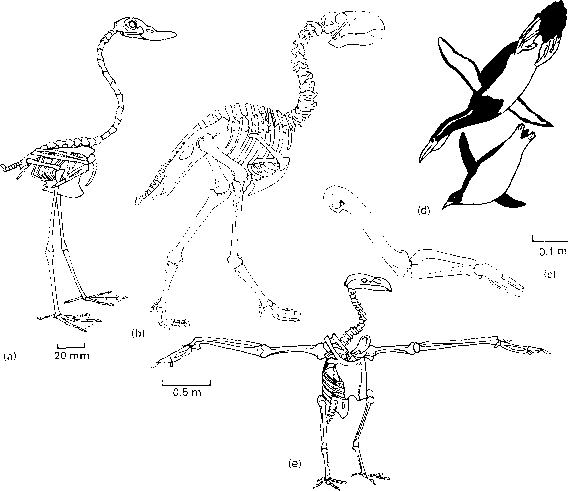 Diatryma, the best-known form (Figure 9.12(b)), was over 2m high and it had the massive leg bones and reduced wings seen in other large ground-dwelling birds. This is not a ratite, however, because it shows features of the limb bones and jaw joint that are shared with game birds and with ducks in particular. 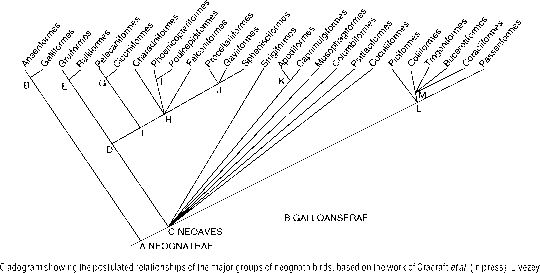 The phylogeny of the 26 or so orders of modern neognath birds is hard to establish. Cracraft etal. 's (in press) phylogeny, based on morphological and molecular evidence, is used here (see cladogram), although these authors and others are actively assessing morphological and molecular evidence. Alternative cladograms by Cracraft (1988, 2001) and Livezey and Zusi (2001), based largely on morphological evidence, and molecular studies by Paton etal. (2001), Van Tuinen etal. (2001) and Garcia-Moreno et al. (2003) have confirmed the difficulty of resolving neognath phylogeny. All authors find strong evidence for the Galloanserae (ducks + gamebirds) as the basal neognath clade, and all other neognaths are termed Neoaves. Some earlier studies based on mitochondrial DNA (e.g. Waddell et al., 1999) placed the songbirds, Passeriformes, in a basal position, but this is contrary to all other molecular and morphological evidence (Garcia-Moreno et al., 2003). One difficulty in resolving neoavian relationships may be that the various orders might have diverged rapidly and it would then be hard to find shared morphological or molecular characters between orders. In addition, it is becoming clear that several orders may be paraphyletic: Livezey and Zusi (2001) and Cracraft et al. (in press) found that members of the traditionally defined Caprimulgiformes, Ciconiiformes, Coraciiformes, Gruiformes and Piciformes fell in different locations in the tree, and Van Tuinen et al. (2001) found evidence against the monophyly of Pelecaniformes. and Zusi (2001) and others. This is still tentative and synapomorphies have yet to be discovered for many nodes. Synapomorphies: A NEOGNATHAE, quadrate with double-headed cranial articulation, vomer-maxilla contact absent, palatines articulate with parasphenoid, articulation between palatine and pterygoid, ilium and ischium broadly fused posteriorly, enlarged calcaneum fused to ascending process; B GALLOANSERAE, basiparasphenoid plate inflated, rounded and broad, and meets parasphenoid rostrum at very acute angle, palatines long and thin, mandibular articulating surface lacks articular depression, long upwardly curving retroarticular process on mandible; C NEOAVES, no morphological synapomorphies identified; D 'waterbird assemblage', no morphological synapomorphies identified; E, no morphological synapomorphies identified; F, upper tympanic recess that does not extend posterior to articular facets for quadrate; G, no morphological synapomorphies identified; H, no morphological synapomorphies identified; I, no morphological synapomorphies identified; J, no morphological synapomorphies identified; K, articular head of humerus lacks groove between articular surfaces, deep long ligamental furrow on humerus; L, perching foot, but no strong synapomorphies; M, no morphological synapomorphies identified. North America, although it might occasionally have scavenged carcasses, or seized small animals for food. The tentative cladogram (see Box 9.4) shows only two substantial clades among the neoavians, a group of largely aquatic forms and a clade consisting of woodpeckers, songbirds and relatives. The other orders, from owls to pigeons and swifts to parrots, are all individual lineages springing from the basal branching point. 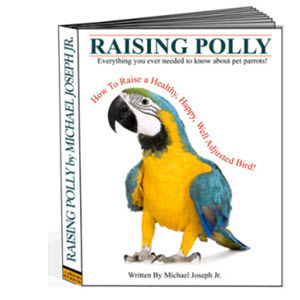 What is the astragalus in birds?